Situated in the municipality of Calvia within a group of towns, Magaluf is a small holiday resort where you would love to spend few hours. After seeing all the other major attractions of Calvia, if you have some time left, pay a visit to this place. The resort is said to serve great service to families, couples and people in groups. The primary attraction of this place is the white sand of the beach. In summer, the white sand glitters like crystal and it is something to watch out for. Apart from this, the place has some amazing eateries and bars where you can enjoy some quality time. Avoid moving around in late nights in Magaluf. Love this? Explore the entire list of places to visit in Calvia before you plan your trip. Fancy a good night's sleep after a tiring day? Check out where to stay in Calvia and book an accommodation of your choice. 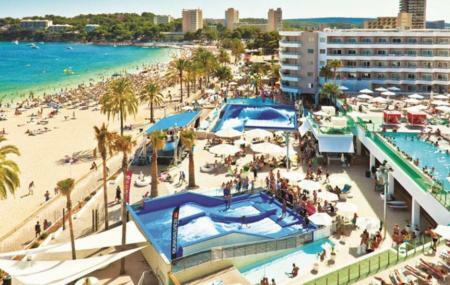 People normally club together Palma Aquarium and The Prince William Pub while planning their visit to Magaluf. People also prefer to start their day with Magaluf.